No more mucking with the htaccess file. Just put an asterisk in the box and save the settings. 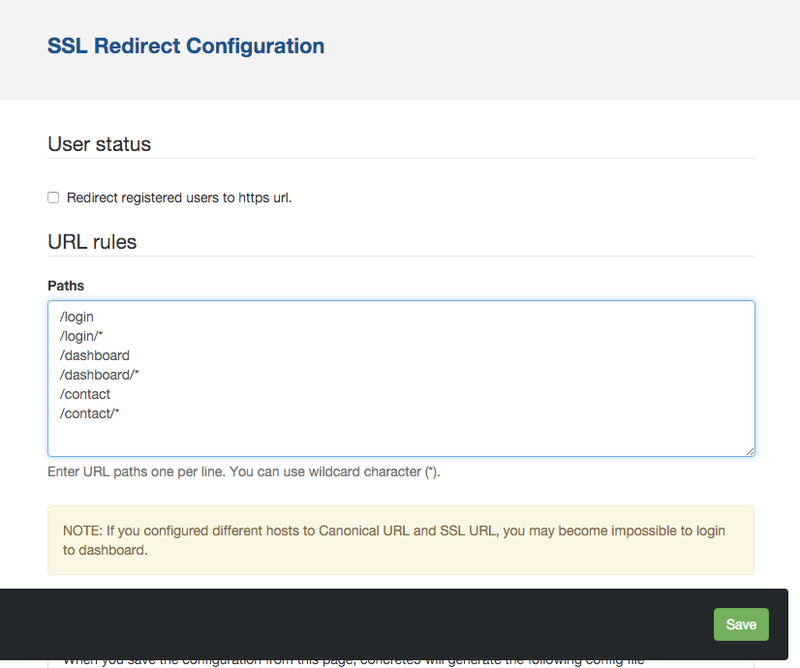 Redirect users to https URL with simple rules configuration on your concrete5 site. Then, your entire concrete5 site will be redirected to SSL. OR you could easily override the setting by creating the following PHP file. By creating the following file, you will not be able to change any setting from the dashboard. This add-on has been released under MIT license, so you can download from GitHub, and use without purchasing on concrete5.org. If you need a support from me or you'd like to use marketplace features (install or upgrade from dashboard), please consider to buy a support ticket. Any support request without contribution on GitHub is not accepted.